If this plant were simply known as "Bleeding Heart Vine" (this moniker belongs to the unrelated Clerodendron thomsoniae), every gardener and their mother would know what it is and be growing it. Unfortunately that is not the case. A pretty a plant with a not so pretty name, Adlumia fungosa, commonly known as Allegheny vine or mountain fringe is an elegant and charming biennial deserving of greater use in gardens. During it's first year of existence, it produces lush mounds of sea-green foliage reminiscent of Dicentra formosa or Corydalis species (to which Adlumia is related). 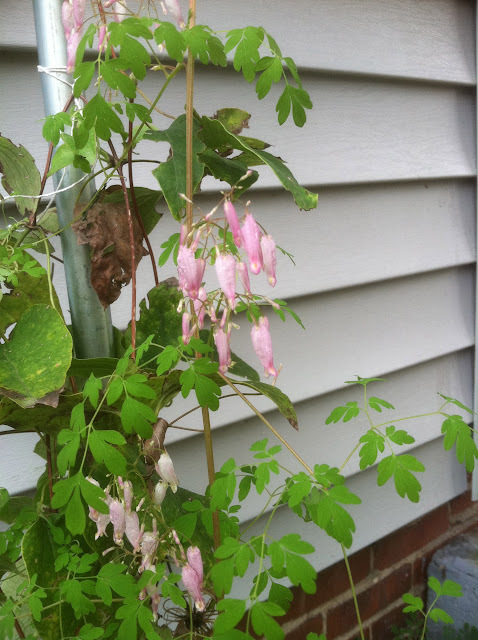 The following summer or fall, from the center of the clump, a slender stem begins to snake it's way skyward, and from the leaf axils are born clusters of dainty, pearly pink "bleeding hearts' that are born successively over a long period. An uncommon native Ohio species, the monotypic genus Adlumia can only be found at scattered sites in Northeastern and eastern part of the state. I am told that a population occurs in Summit county on an abandoned quarry, so while it may be a rare plant, it does appear to tolerate disturbance in natural ecosystems. The species occurs over a large geographical range in the northeastern and great lakes states, but is most abundant in the New England states. In a family (Fumariaceae) that is well-known for species with exceptionally recalcitrant (unable to tolerate dry storage and/or short window of viability) seeds, this species has seeds that tolerate dry storage. A friend sent 3 packets of seeds. Each were harvested in a different year: 2007, 2008, and 2010. Each accession performed differently. The pot at the top of the picture was sown with seeds dry stored since 2007, the middle pot sown with seeds dry stored since 2008, and the bottom bot sown with seed from 2010. As you can see, the seeds can be dry stored and retain viability for at least a few years. Close-up of a vigorous seedling of Adlumia fungosa. This is about the actual size of the plant. I am going to plant a number of these seedlings around my yard and see how they perform under different conditions. My yard is quite shady; this should be of benefit for cultivating this species. The photo of the flowering plant was growing in a shady alcove garden that is protected from strong, drying winds.